The first known demonstration of the oxygen effect was by Gottwald Schwarz in 1909 . He demonstrated reduced skin toxicity when the skin was compressed (i.e. oxygen level reduced through expulsion of blood), although the specific role of oxygen was not known at the time. Further studies eventually demonstrated that the presence of oxygen enhanced cell killing for photons and electrons but not for neutrons . Methods to exploit this effect have been tried since then to improve the therapeutic ratio. 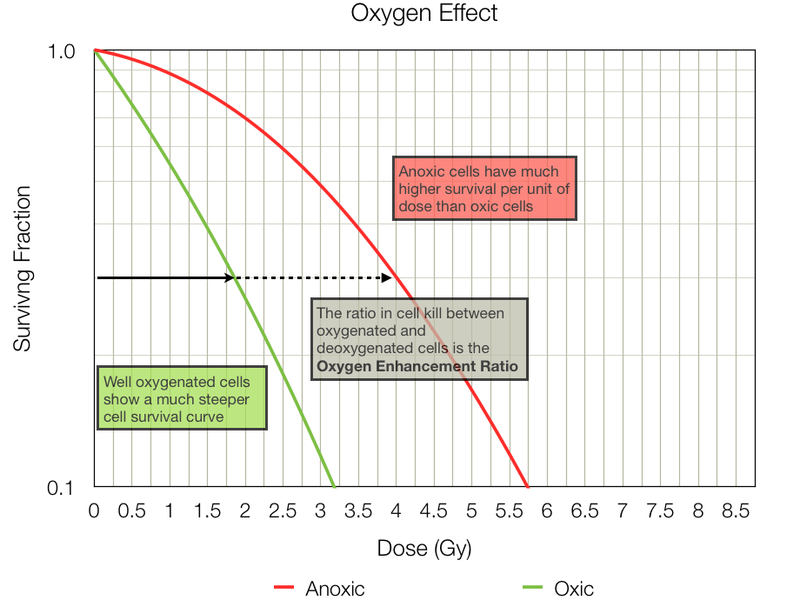 The oxygen effect refers to the increased killing of cells the occurs in the presence of oxic conditions, particularly with low-LET radiation such as photons or electrons. The OER is dependent on the dose, radiation quality, cell cycle stage and cell type. The OER is about 2.8 for most cells exposed to ionising photon radiation. The oxygen effect arises due to the indirect action of low LET radiations. These radiation types typically ionise water molecules in the vicinity of the DNA, forming hydroxyl radicals. These radicals interact with the DNA molecule, causing various types of damage including single and double strand breaks. These breaks can be made permanent by the presence of oxygen within the cell. When hypoxia is present, the damage may repair itself before any lasting effect is seen. 1. Schwarz, G. (1909). Ueber Desensibilisierung gegen röntgen-und radiumstrahlen. Münchener Med Wochenschr, (24), 1–2. 2. Gray, L. H., Conger, A. D., Ebert, M., Hornsey, S., & Scott, O. C. (1953). The concentration of oxygen dissolved in tissues at the time of irradiation as a factor in radiotherapy. British Journal of Radiology, 26(312), 638–648.